The fabric is a silk chiffon/viscose burnout, so is slightly sheer where the viscose component is absent. I am underlining it in black viscose lining, partially to disguise the seam allowances, and partially so that it will match my (slightly darker) emerald shoes! 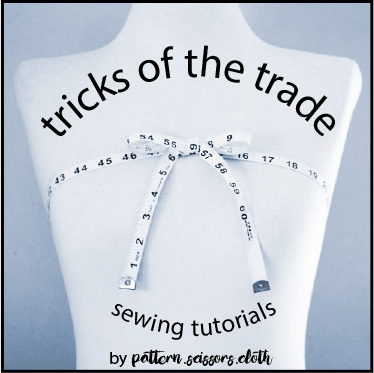 I am not intending to attach the underlining at the side seams or lay it within the tucks, so that the dress retains the chiffon look as much as possible. The pattern is Burda 11/2008/111 Dress, and although it is a simple shift dress I had to make two toiles! I had to remove a lot of the ease out of the back bodice, reduce the back neck to underarm length, and scoop out the back armhole a bit. I also took a wedge out of the front armhole and moved it into the neckline tucks, centred the shoulder seam, and lowered the back neckline 3cm. I do have a fairly erect posture, but I think a lot of what I removed was there to allow for ease of movement with a sleeve attached. 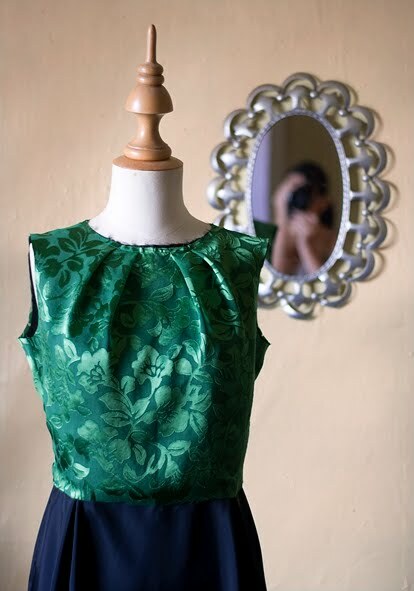 Looking at the pattern, it uses the same bodice pieces as the version with sleeves (#112). This is why it pays to make your own patterns from your own blocks if you can – in this case it definitely would have been quicker! I have cut the skirt lining as you can see – it just needs to be taken in a little, so will cut the rest of the dress tomorrow….. Pretty! I like the tucks and the shape of the bodice, looks good so far!